Although it is one of the most sharable file formats, it may at some point become necessary to export PDF to JPG. You may want to do this for various reasons, like for example when you need to share a section of the PDF document with someone or you want to create an image copy of the content of the PDF. Converting PDF to JPG can be quite easy with the right program. This article shares the right program with you, showing you the easiest way to export PDF to JPG. 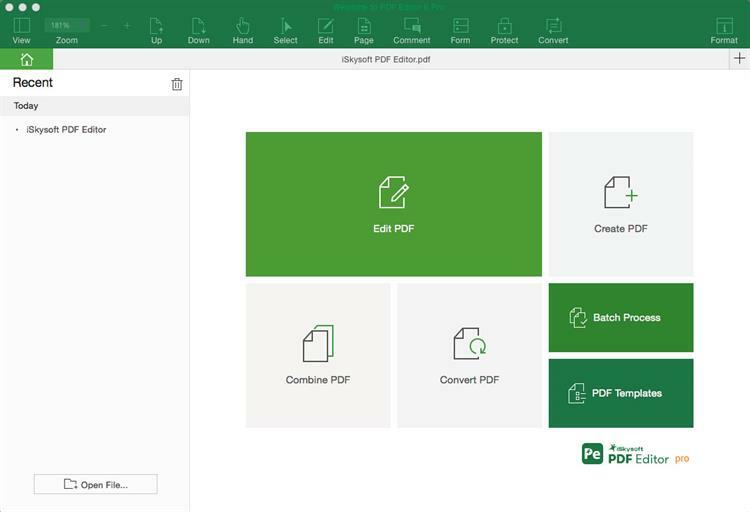 To easily export any PDF file to JPG, you need a program that is designed to help you manage PDF documents easily and one that has all the tools you need to not just export a PDF to another format but also edit the PDF if you need to. In that context, the best tool to convert PDF to JPG is iSkysoftPDF Editor 6 Professional for Mac (or PDF Editor 6 Professional for Windows). Here’s how to export PDF to JPG easily using iSkysoft PDF Editor for Mac. Begin by installing iSkysoft PDF Editor Pro 6 to your computer. When installation is complete, open the program. The next step is to open the PDF document you want to export to JPG. This program provides you with multiple options to open the PDF. You can simply drag and drop the file into the program’s main interface or you can click on the "Open File" button and select the file you want to open. You can also click on the "File" menu and then select "Open" to browse for the file you need. Once the PDF is open, you can choose to edit the document in several ways before exporting it as a JPG. 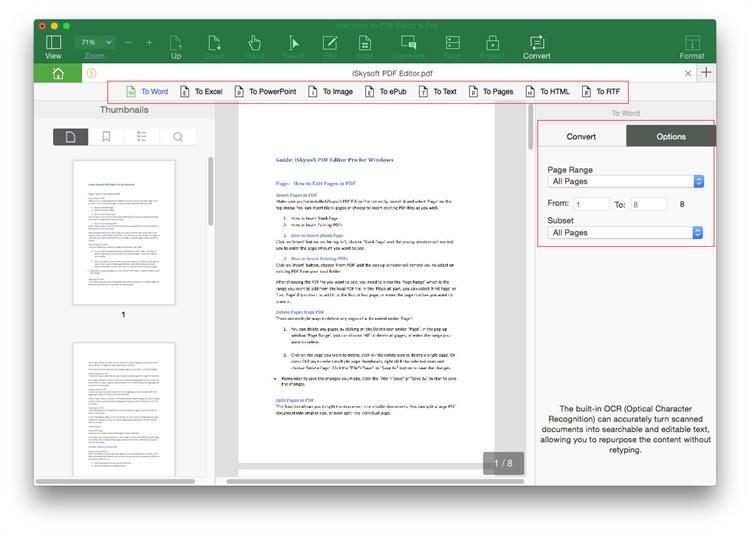 For example, to edit the text on the document, click on "Edit" and then click on any section of text within the document. Click on "Paragraph Mode" option in the control panel to your right and the program will target the text to be edited by paragraphs. The "Line Mode" option will target the text per-line. You can simply change the text, the font size, font color and even font style as you desire. Once you are happy with the edits made, you can then simply click on "Convert" and then select "To Image". Set the page range and then click "Convert" to begin the conversion process. As you can see from the simple tutorial above, iSkysoftPDF Editor 6 Professional for Mac (or PDF Editor 6 Professional for Windows) is one of the easiest programs to use when you want to export PDF to JPG. The entire process regardless of the size of the PDF document shouldn’t take more than 5 minutes which is great when you don’t have a lot of time. But there are other reasons you should choose this program over others. They include the following highly useful features. 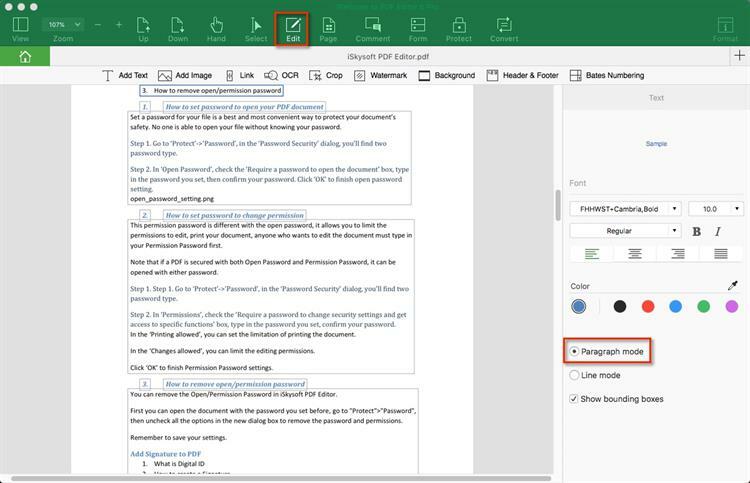 Aside from being able to easily edit the text in the PDF, you can also easily edit the images and pages or even add and remove watermarks from any PDF document. The conversion options are also numerous. You can export the PDF to JPG and other image formats as well as to popular document formats like Word, Excel, PowerPoint and HTML. It also allows you to easily create a PDF document in a single click by simply opening a document in the program and then saving it in PDF. Have a scanned or image-rich PDF? iSkysoft PDF Editor 6 provides you with a powerful OCR feature that will help you easily edit the PDF document. You can also add custom stamps and comments to the document or even highlight and underline the text in the document. Adobe Acrobat is the premier PDF tool, used to make, edit and convert PDFs to other formats. It therefore makes sense that Adobe should be on the list of programs that can help you export PDF to JPG easily. To use Adobe Acrobat, download and install the program to your computer (you may need to purchase the program to use its full features) and then follow these simple steps. Step 1. Begin by opening the PDF document you want to export to JPG. You can do that easily by clicking on "File > Open" and then selecting the PDF file you want to convert. Step 2. With the file open, click on "Tools > Export PDF" and in the resultant window, click on "Image" and then select "JPEG" as the format. Note: Please note that you can set the conversion settings by clicking on the gear icon near the conversion format you have selected. In this case, you can choose to change the quality in terms of resolution and color of the resultant JPEG file. Step 3. In the next window, select the folder location you want to save the file to. You can choose to save the folder to your computer or your document cloud. You can then simply open the converted JPG image by double clicking on it. When exporting PDF to JPG you can’t overlook online tools. Ezgif is one of the most useful online tools to help you export PDF to JPG online. Not only are they completely free to use, they can also be quite effective and provided an easy and quick way to export PDF to JPG quickly. But before you export PDF to JPG online you should know that there are several downsides to this method. One of the most obvious ones is the fact that you can’t edit the PDF document before converting. Also, many are not ideal for sensitive documents since they pose a security risk. You don’t know how long the document remains on the site after conversion. 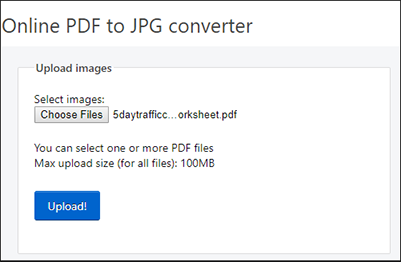 With that out of the way, the following is a great online tool to help you export PDF to JPG and how to use it. Step 1. Go to the official website. On the website, you should see a "Choose Files" button. 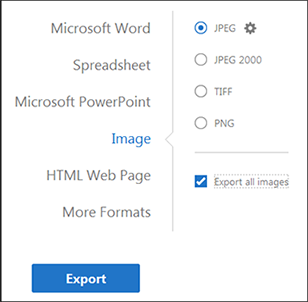 Click on it to select the PDF document you want to export to JPG and then click on "Upload." Please note that the file you upload needs to be less than 100MB in size. Step 2. 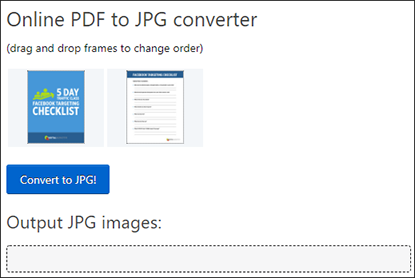 Now click on "Convert to JPG" and the program will provide you with a JPG version of the uploaded PDF. Please note that if you have multiple pages, you will have multiple images. Click on "Download All Images as ZIP archive" to save the JPGs to your computer.